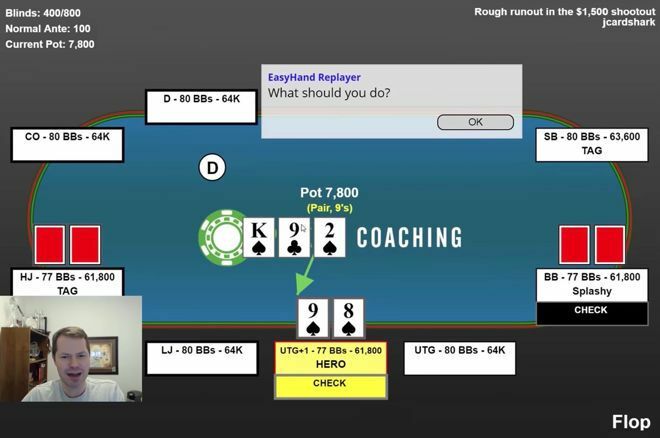 In a multi-way pot, @JonathanLittle tells why he chose to play a flush draw slowly rather than bet.
.@JonathanLittle on a shootout hand in which he had to decide whether to play a flush draw fast or slow. Today I want to share another hand from the second table of a $1,500 no-limit hold'em shootout I played at the World Series of Poker. Again, with a shootout event, you have to win the table to advance, so it's like a "winner-take-all" situation. There were still eight players at the table when this hand took place in the 400/800/100 level. Picking up in early position, I raised to 2,200 from my 80-big blind stack. As I discuss in the video below, I like adding some lower suited connectors like this to my raising range. Doing so can make you a little more difficult to play against than is the case if you're only raising with big cards and premium starters. A tight-aggressive player in the hijack called as did a splashy player in the big blind, with both having similar-sized stacks to mine. The flop came , and the big blind checked. Here a lot of players will just blindly bet — after all, we have a pair and a flush draw. But here, and especially multi-way, I like checking sometimes since if the pot does get very big we're probably not going to be too happy. After it checked around on the flop, I made my flush on the turn. Here (as I explain) I have one of my best made hands and I bet it. Know when to play slow and when to play fast. Alas, the runout was a rough one for me as a fourth spade came on the river, presenting another decision for me. How would you play this river?